Blue Planet Aquarium is open daily 10am to 5pm and 6pm at weekends and school holidays, throughout the year – excluding Christmas Day. Live Shows in the Aquatheatre EVERY day – first show starts from 11.30am each day with 3 shows on weekdays and more at weekends and holidays. 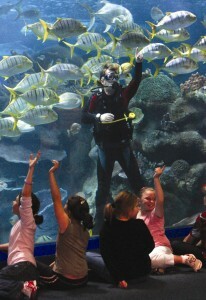 Come and see the Divers in the Spectacular Aquatheatre window! Daily Talks and Feeds schedule always include a daily Otter feed and other featured animal feeds and talks. Blue Planet Aquarium reserves the right to alter show times and talks schedule and opening and closing times without prior notice. Please call 0151 357 8804 for more information. Blue Planet Aquarium reserves the right to alter opening and closing times without prior notice. Please call 0151 357 8804 for more information. Blue Planet Aquarium is a safe and family friendly attraction with easy accessibility for push chairs. Blue Planet Aquarium has ample on-site parking. Please be aware that a charge of £2.50 applies to Blue Planet Aquarium visitors, regardless of length of stay. Blue Planet Aquarium also has easy access throughout for Guests with Disabilities and wheelchairs are available for hire. No adventure is complete without a rest break in our Restaurant featuring awesome underwater views and Delicious Meal Deals and Treats. Or stop off in the Gift Shop for the best selection of mementos, gifts, toys and books.